This recipe, a combination of a traditional Scandinavian Pork Roast stuffed with Prunes and recipes from America's Test Kitchen. Most Swedish cookbooks include a version of Prune-Stuffed Pork Loin--the brining process and Rosemary-Maple Glaze just makes it better. 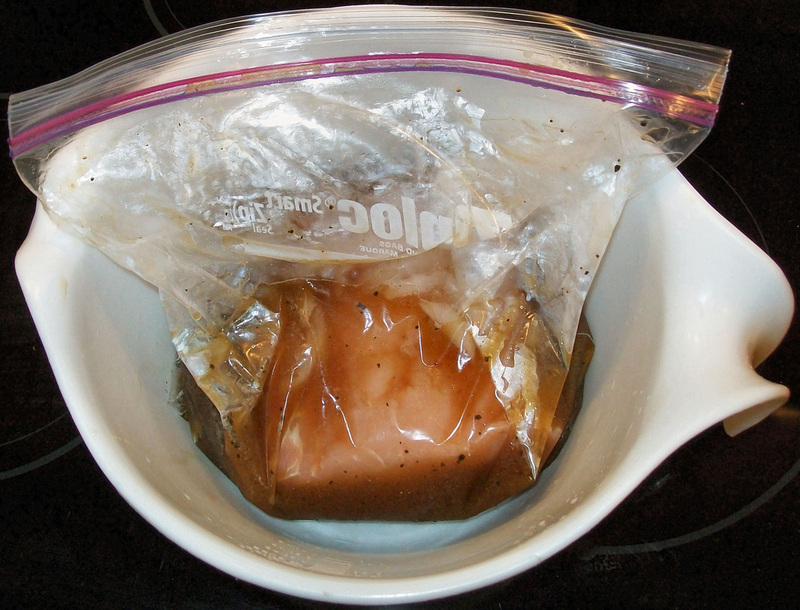 Brining significantly improves texture and flavor, and makes pork much juicier. The brine recipe, an adaptation from Alton Brown, shows versatility with options. 1. 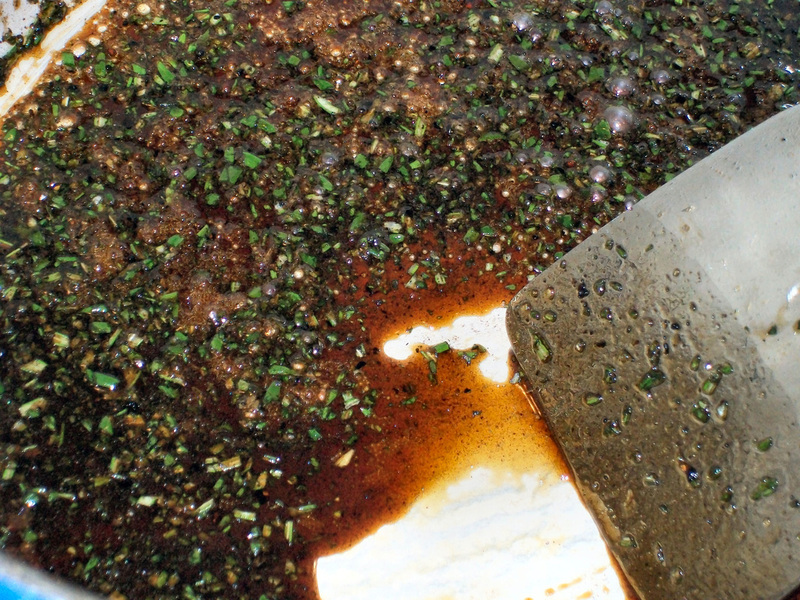 Bring the vinegar to near boiling in a microwave or on stove-top. Remove from heat. Pour the salt, brown sugar, pepper, and dry mustard into the vinegar and stir briskly to dissolve as much salt as possible, let sit for 5 minutes or so, and stir again. With most of the solids dissolved, stir in the ice to cool the brine. 2. Place the pork loin into the zip-loc bag. Pour brine over the pork loin, remove excess air and seal the bag. Place this into a mixing bowl and refrigerate for 2 hours. 3. Remove the pork loin, rinse and pat dry, placing it on a cutting board. The following steps explain meat preparation and baking after brining. 4. Using a sharp Chef's knife, slice the pork loin approximately half-way through the center, laying it open like a book. 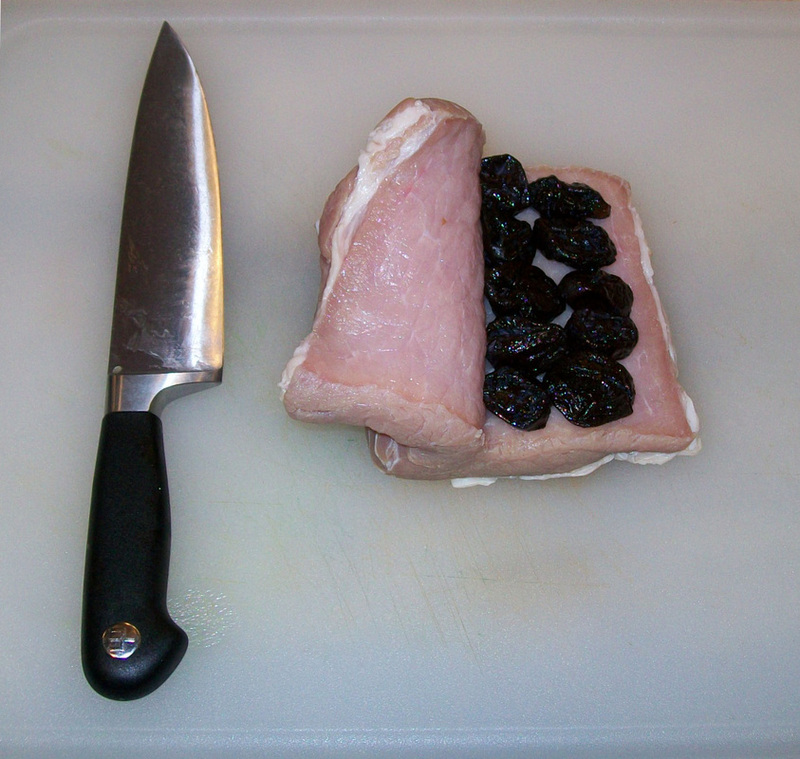 Fill the loin with pitted prunes, close into the shape of a roll and tie securely and evenly with kitchen twine. Roll the pork loin in fresh ground black pepper, lightly coating all sides. For more information about brining and details on tying pork loin, see Alton's book "Good Eats, The Early Years." 5. Pour Olive Oil into a small Dutch oven or iron skillet and bring to medium/high heat (see warning). Brown for approximately 5-10 minutes on all sides, ends first. Once well-browned, loosely tent the pork loin in aluminum foil on a plate or cutting board (to keep warm and capture juices). 6. Pour off olive oil from the dutch oven. Return to medium heat and add Maple Syrup and Rosemary. Work the bubbling syrup back and forth over the bottom of the dutch oven, using a metal spatula or wooden spoon to loosen the caramelized bits. Once the bottom shows clean, remove from heat. 7. 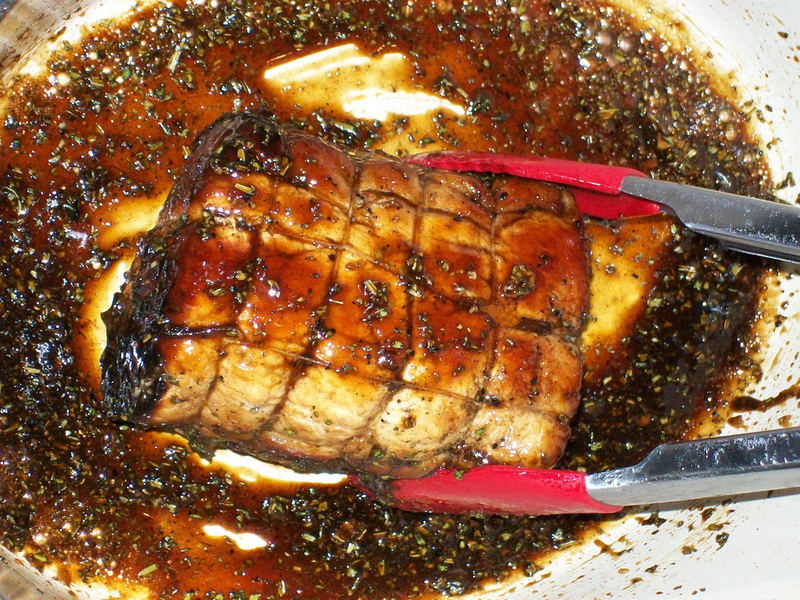 Return pork loin to pan, roll with tongs to coat all sides in the glaze, ending with the seam down. In an oven pre-heated to 325°F, place the dutch oven on the center rack and bake for 45 minutes. 8. 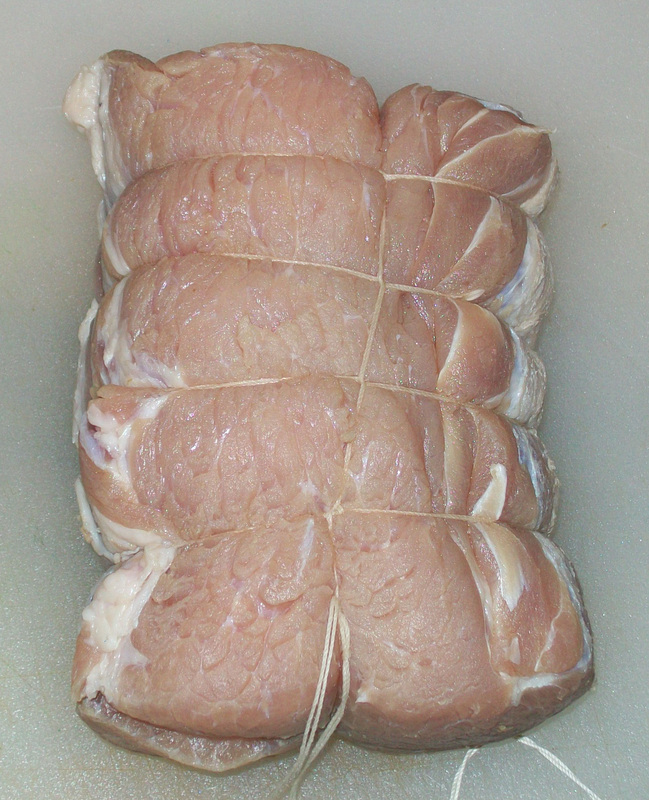 Re-glaze the pork loin twice during baking time, by rolling it on all sides, again ending with the seam down. Remove and loosely tent for 15 minutes, to allow the remaining glazing to cool and thicken. Cut and remove the twine, plate the pork loin, slice and spoon the glazing on top. * Whether you use Non-Iodized, Kosher or Sea Salt, measure by weight not by volume. * Try dried Sweet California Figs in place of pitted Prunes. * Serve with steamed new potatoes and a vegetable. 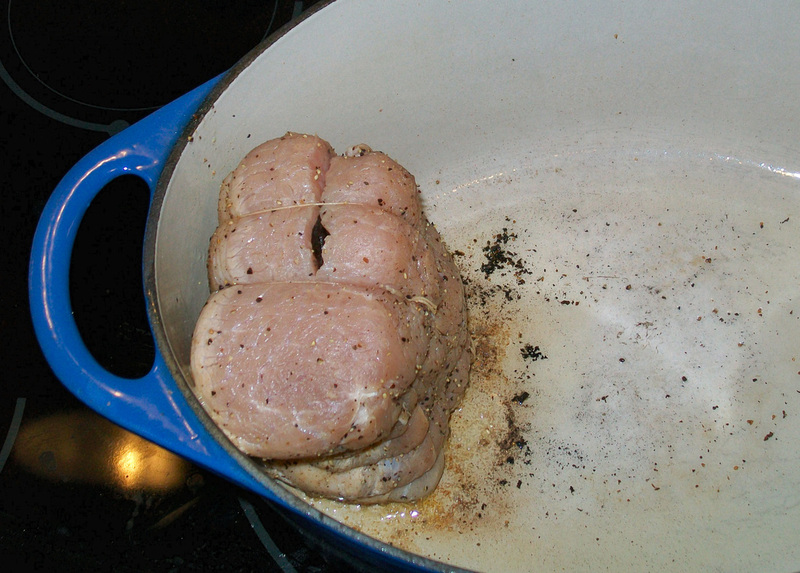 * Using a dutch oven makes standing the pork loin up on end easier while browning. * De-glazing the pan improves the flavor of the sauce, while making clean-up easier! * Wine Suggested for this recipe: Pinot Noir. A delicate, floral red wine. * Trichinella Spiralis is not a concern once the center temperature reaches 137°F, well below "medium," no need to overcook the pork! * Soaking meats in brine longer than recommended will only increase the salt content.